Photograph of Albin Kasper Longren's fold-wing biplane parked in front of a garage. In less than 30 seconds, four pins could be removed and wings folded back so the plane could be stored in a Model T Ford garage. The composite fuselage was made of a hard vulcanized fiber molded to a streamline form. It weighed 550 pounds with side-by-side seating. 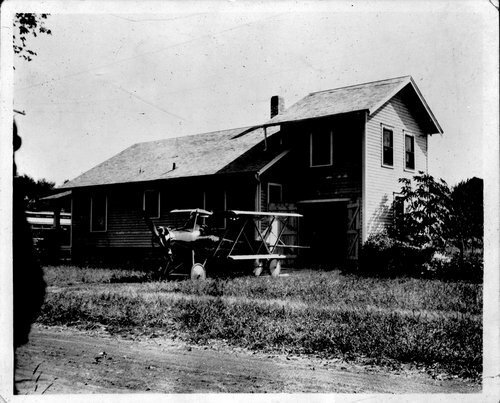 The trial test flight took place on August 6, 1921 from Kelsey's potato field located east of the Longren factory at 1401 Winfield in northeast Topeka, Kansas.